Tomorrow is the last chance to enroll for health insurance through the health care marketplace. Coverage will be effective through 2017. Watch for the release of Gov. Greiten’s state budget this week. Following the release, MHA will announce a series of member calls to explain implications for hospitals. This week, the Senate Health and Pensions Committee held a hearing on Senate Bill 74, sponsored by Sen. Rob Schaaf, and Senate Bill 231, sponsored by Sen. Dave Schatz. Both bills relate to the creation of a prescription drug monitoring program in Missouri. In years past, Sen. Schaaf has been an outspoken opponent of a PDMP. MHA testified in favor of Sen. Schatz’s legislation, which mirrors the PDMP legislation filed by Rep. Holly Rehder in the House. After the hearing, Sen. Schaaf held an executive session on his version of the bill, and it was voted out of committee on a 5-2 vote. Since it is unlikely SB 231 will advance in Sen. Schaaf’s committee, Sen. Schatz filed an identical bill that has been referred to a committee he chairs. It is expected to be scheduled for a hearing in the next couple of weeks. 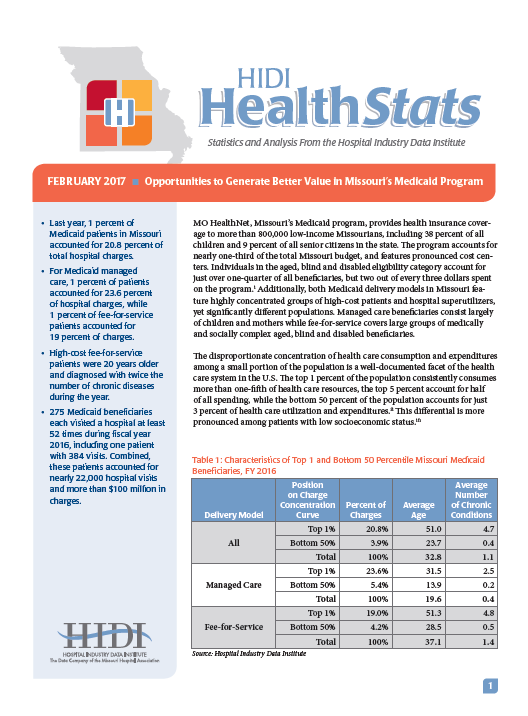 The February edition of HIDI HealthStats highlights opportunities to generate better value in Missouri’s Medicaid program. Because of new paradigms in accountable care and population health management, one particular segment of patients — hospital superutilizers — has been the focus of emerging models of patient-centered care delivery that concentrate on both medical and socioeconomic conditions. Community-integrated and targeted care coordination for hospital superutilizers is a commonly prescribed strategy for reducing costs and inappropriate emergency department utilization, while improving health outcomes for beneficiaries. Last year, more than half of MO HealthNet hospital patients had one or two hospital encounters (41 and 22 percent, respectively), and three-quarters had three or fewer visits in 2016 (310,507 patients, or 76.2 percent). The remaining 24 percent of patients had at least four encounters which is a commonly used threshold for hospital superutilization. These patients accounted for 57.6 percent of all MO HealthNet hospital inpatient and ED visits during 2016. Nationally, 4.5 to 8 percent of ED patients have four or more visits per year, accounting for 21 to 28 percent of all visits. Nearly 15,000 MO HealthNet beneficiaries (3.6 percent) visited a hospital ED or were hospitalized 10 or more times during 2016. These patients accounted for 20.3 percent of all hospital visits, a ratio of nearly 6-to-1. Within this subset of MO HealthNet hospital patients were 275 individuals with between 52 and 384 hospital encounters during 2016 — an average of at least one visit per week. The next education session for hospitals participating in the Outpatient Quality Reporting Program has been scheduled for Wednesday, Feb. 15. The webinar, titled “Hospital OQR Program CY 2018 Chart-Abstracted Validation Overview for Selected Hospitals,” is offered at 9 a.m. and 1 p.m. Registration is required. January is Glaucoma Awareness Month. Glaucoma is a leading cause of irreversible blindness in the U.S.